A Circular Computer With a Unique Design. The Cerise Circular computer is a unique design that we conceived and is manufactured in the USA. It offers all the power and the reliability of a fully-fledged desktop wrapped up in a very attractive and eye-catching circular case. 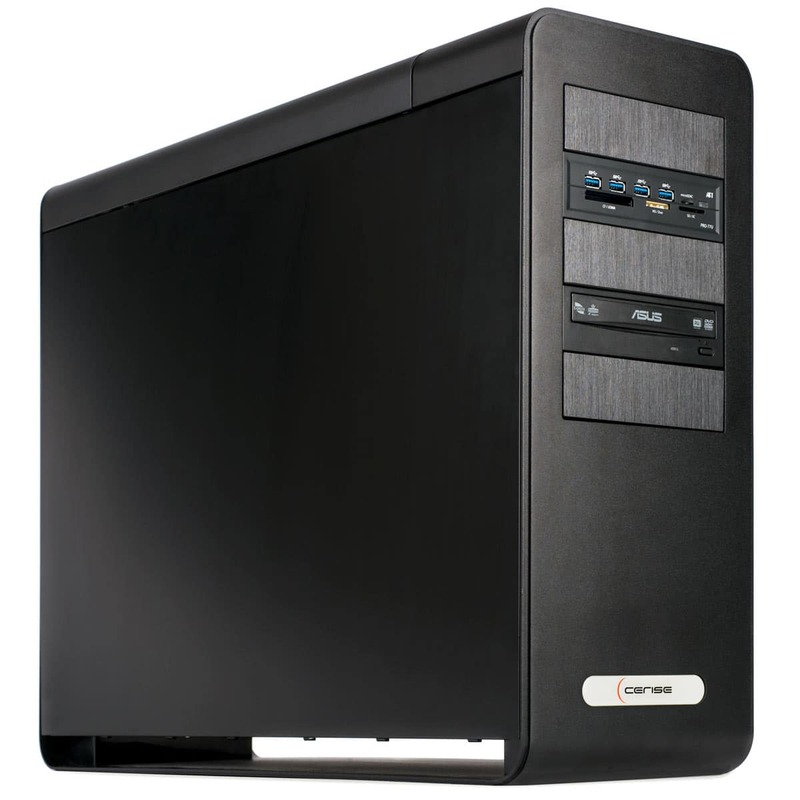 The computer hardware for this case consists of industry standard parts so all components are easily upgradeable. The case stands approximately 15” high and 12” in diameter. The fans inside the case draw air from the bottom of the case. In regular use, this computer is extremely quiet. We designed and built cable management features into the Cerise Circular Computer case so that there is no rat’s nest of cords coming out of the back even when the computer is fully hooked up. The circular case itself easily lifts off the computer frame to reveal the industry standard parts inside. All parts are upgradeable and the graphics card is particularly easy to replace. The case itself is made of aluminum to aid cooling. All ports are easily accessible from the top of the computer. The Cerise Circular computer takes any single-socket CPU from a Celeron all the way through to any Xeon in the E5 2000 series. For CPUs up to four cores, the motherboard can accommodate up 32GB of DDR4 RAM. For Xeon CPU’s, the motherboard can accommodate up to 64GB DDR4 RAM with ECC and registered memory. 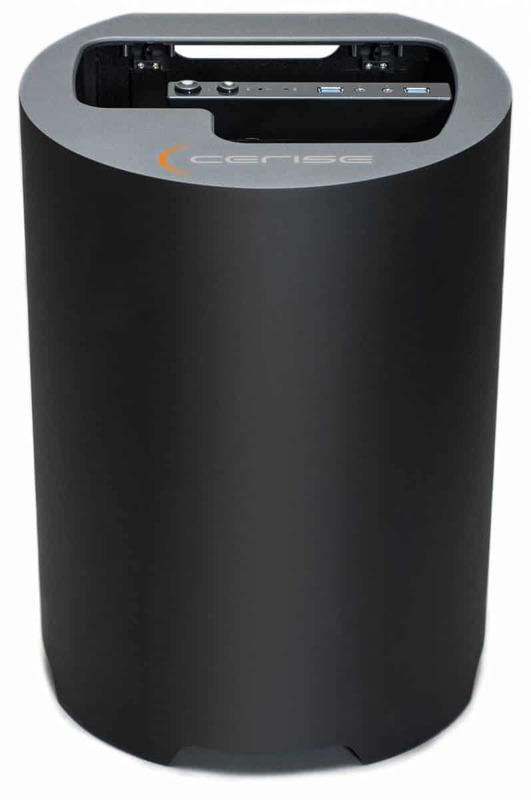 The Cerise Circular computer has a very flexible storage configuration. It can accommodate up to four 2.5″ drives and one M.2 drive. If a mechanical 3.5″ hard drive is installed, this computer can accommodate two 2.5″ hard drives and one M.2 drive. The Cerise Circular can take any GeForce graphics card, even a GTX 1080 or any Quadro card up to an M4000. 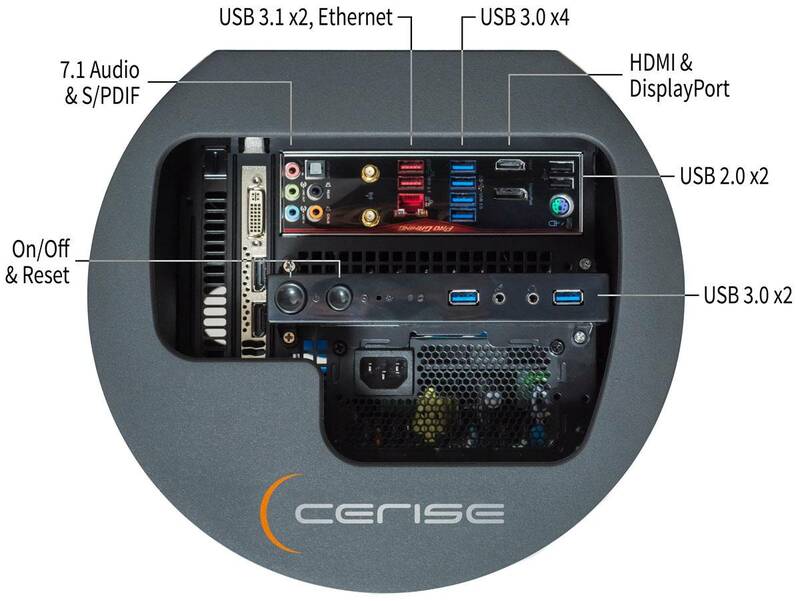 The Cerise Circular was designed so that all connectivity ports and the on/off switch are on the top of the case for easy access. The computer has two USB 2.0, six USB 3.0 and two USB 3.1 ports. Wifi is an available option with a high quality USB wifi adapter. The Cerise Circular computer employs large slow moving fans for cooling. There is one 140mm fan that draws in cool air at the bottom of the case and a 120mm fan for the CPU heatsink. 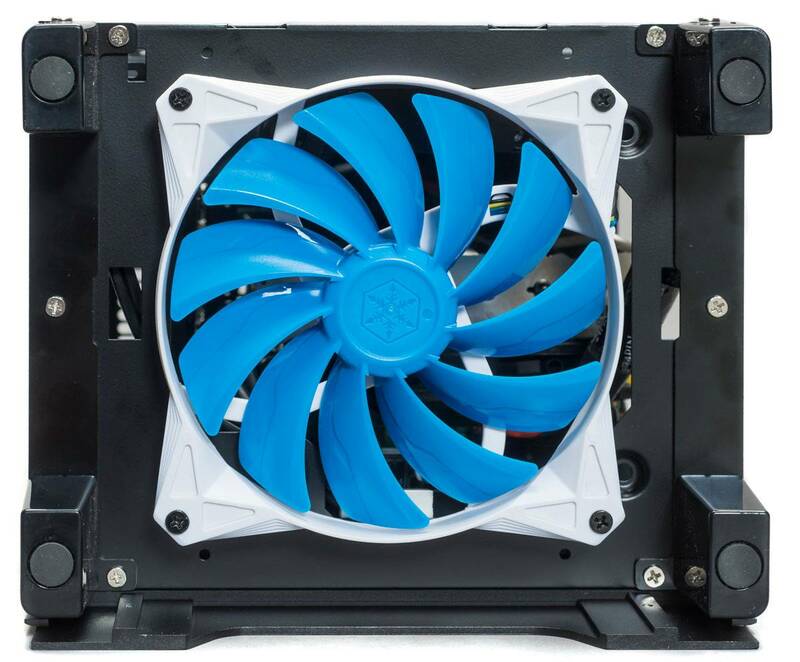 The case’s thermal properties work together with the natural cooling characteristics of air so that the large fans draw cool air from the bottom of the case and expel the warm air at the top. We tested the case’s thermal properties extensively at the time that we designed the case and neither the CPU nor the graphics card experience any throttling even when working at full capacity. 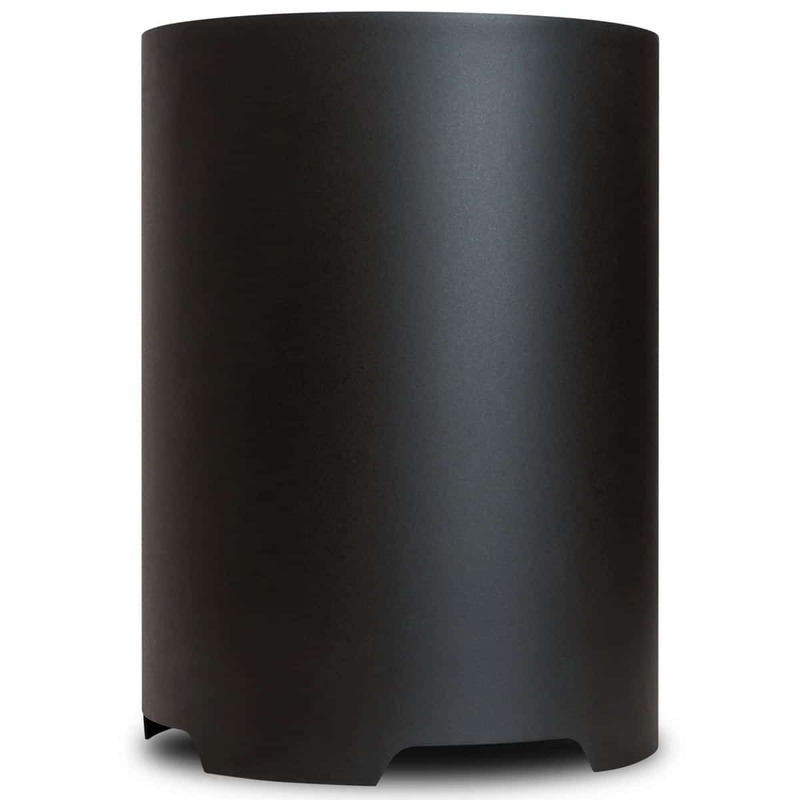 The large diameter fans enable the computer to be extremely quiet during normal use. Need help? Call us toll free at 443-759-2382 Mon–Fri 8am–6pm EST. 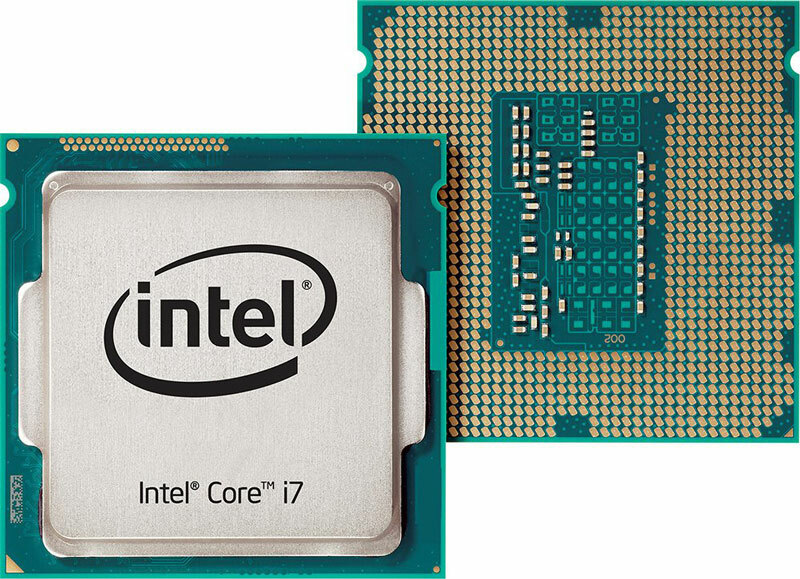 The central processing unit or CPU is the “brains” of the computer and is the component which performs most of the of the computer’s calculations. The CPU’s speed is measured in Hertz (Hz) or cycles per second. Virtually all CPU’s today have multiple processors or ‘cores’ on one piece of silicon. This means the operating system splits a program into ‘threads’ and then distributes those program threads to the available cores so that they can be processed. The ease with which a program can be threaded is termed ‘multithreading’. Photo editing programs such as Photoshop are not highly multithreaded, so they work faster with CPU’s that emphasize speed over cores. Video editing programs however, such as Premiere Pro are highly multithreaded so they work faster with CPU’s that emphasize cores over speed. In practical terms, this means for image editing programs such as Photoshop you should choose a four-core CPU with a higher speed. For video editing or if you use multiple programs simultaneously, you should choose a CPU with 6 or more cores. For many people today, the line between photo and video editing is becoming less distinct as most cameras now shoot video. If you edit photos and video, an honest assessment of the ratio of photo to video editing will tell you which type of CPU you should lean towards. Your CPU draws the data that it will process from the memory or RAM. The CPU draws all its data from RAM as opposed to the hard drive where it is stored because RAM is many times faster than even the fastest hard drive. If the CPU drew all its data from the hard drive, it would significantly slow down the computer and minimize any benefit to a fast CPU. Sufficient RAM gives your computer enough space to process the data with all the programs and plugins you want simultaneously. Insufficient RAM is the single major cause of slow or crashing computers because there is simply not enough space in the memory to hold all the programs you are working on. Plan on RAM that is at least four times greater than the programs and data you are working with. Video and image editing programs make multiple copies of a file before the edits are complete. So if you have 4GB of programs and data open at any one time, you should have at least 16GB of RAM. RAM today is relatively cheap so it is the most cost-efficient way of keeping your computer fast. The optimum hard drive set-up for digital content creators such as photographers and video editors is one hard drive for the operating system and programs and a separate hard drive for data such as photo and video files. Many digital content creators find a third hard drive for dumping their newly created files after a shoot very useful. Once files have been dumped onto this 3rd hard drive, they are easily moved throughout the computer system and then can then be returned there after editing for short term storage. 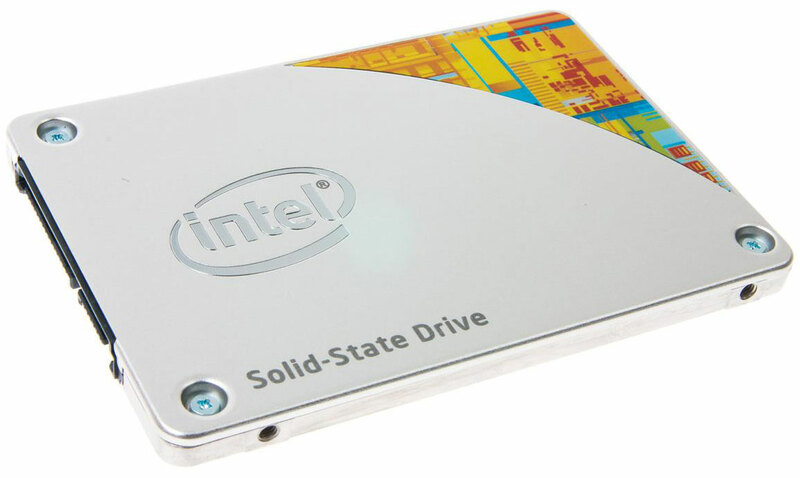 Samsung PCIe solid state drives are roughly 3-4 times faster than SATA solid state drives. Intel Optane drives have very high random read and write speeds so this will make your system feel very snappy. This is the drive for your data such as photo and video files. Many digital content creators find a third hard drive for dumping their newly created files after a shoot very useful. Once files have been dumped onto this 3rd hard drive, they are easily moved throughout the computer system and then can then be returned there after editing for short term storage. The video card processes visual information from your CPU and displays it on the monitor. Regular consumer video cards and monitors show a maximum of 16.77 million colors. Quadro workstation video cards give 10-bit color and if they are paired with a 10-bit monitor you will see more than 1.07 billion colors or 64 times more colors than a regular consumer video card. This covers 99% of the Adobe RGB color space. For digital content creators, if exceptional color accuracy is important to you, a Quadro workstation card with a 10-bit monitor is a necessity ! 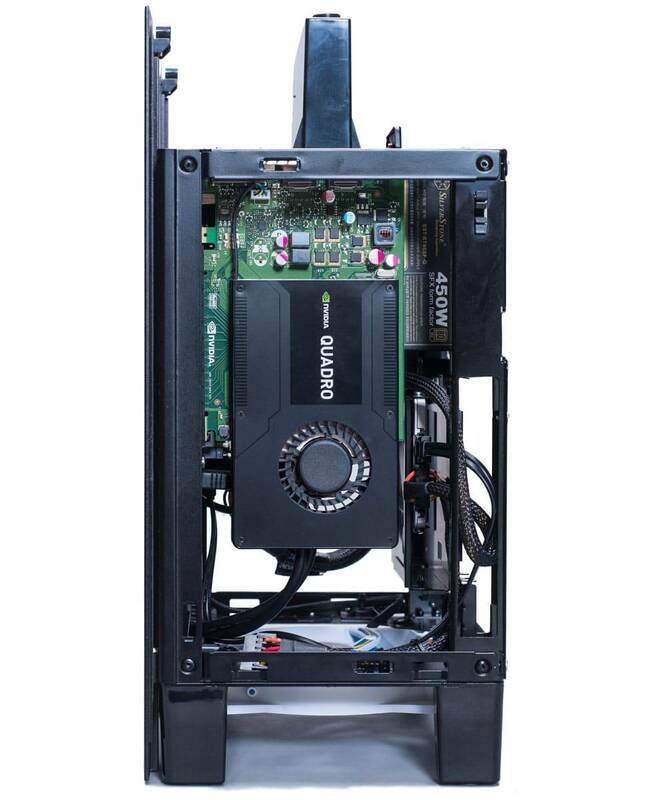 Quadro workstation video cards are an absolute necessity for CAD applications like Solidworks. Choose a 10-bit monitor to view all the colors that a Quadro card can display. We check every monitor for dead pixels and we install the monitor driver on your computer for the best possible performance. eSATA provides a fast and efficient method of transferring data into or out of your computer. Select an option... eSATA Is Standard On 6-Core Systems & Above. We install WiFi on the Cerise Circular Computer through a USB WiFi adapter. The adapter sits on top of the computer clear of any obstructions. This helps establish a clear link between your computer and your router. Our productivity software comes with a DVD disc and a product key card. We install all updates at the time we install the software. Pre and post-sales support is an important part of the package we offer you. As well as being very attentive to you at the time you choose the components that will make up your computer, we are always available for tech support if something goes wrong or you just want advice on upgrading or installing new hardware and software. All Cerise computers come with a one-year warranty. This means we will fix any malfunctioning hardware free of charge for one year. You just pay for shipping to us. If the malfunction occurs within 30 days of you receiving the computer, the shipping is on us. You can get the same coverage for 2 or 3 years at an additional cost.